The Lassen Volcanic National Park Highway is closed for most of the year. The date the highway is completely open varies a lot from year to year, as late as July 26th in 2017. It closes around late October. Click here for current status. Enter at Kohm Yah-mah-nee Visitor Center via highway 89 from the south. Get maps and talk to rangers. See the film. 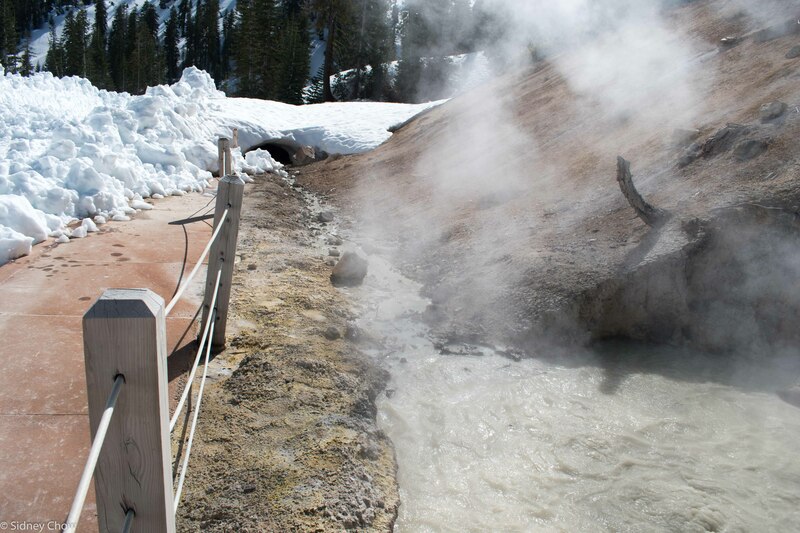 Stop at Sulphur Works to view the fumaroles and mudpots for a first taste of geothermal features. Hike to Bumpass Hell to view geothermal features. Hike to Lassen Peak if physically able. It is 2.5 miles one way with 2000 feet of elevation gain up to 10,400 feet. Keep altitude in mind when deciding if you should take this hike. Hike Kings Creek Falls if you passed on Lassen Peak. Hike to Summit Lake if time allows. Stop at Devastated Area to view Lassen Peak. Stop at Chaos Crags and Chaos Jumbles. Hike the Manzanita Lake trail if you passed on Lassen Peak. 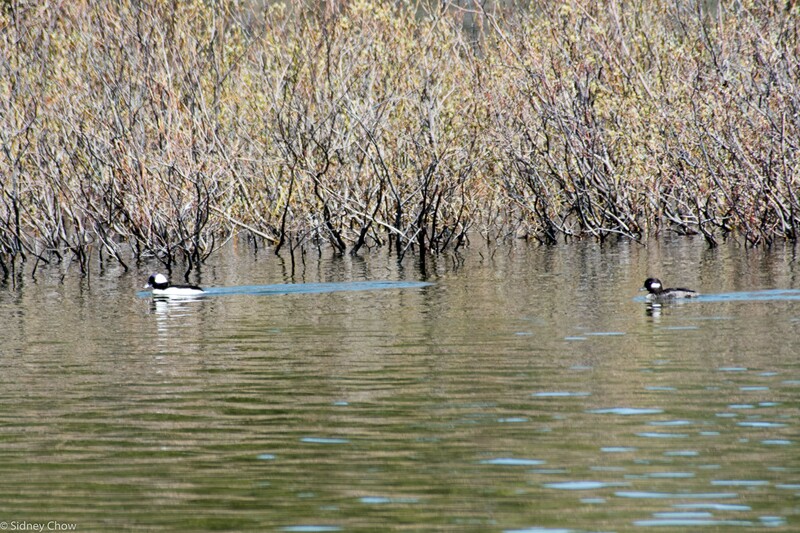 If you have more than a day, explore Butte Lake on the Northeast side and Juniper Lake on the Southeast side. We knew snow covered most of the park well into July, so we were taking our chances to visit in mid-May. The huge snowbanks were a “wow” sight for us southerners and an attraction in its own right. Seeing is believing and we now appreciate why it takes so long to clear the road. The drive to the park was scenic with snow capped mountain peaks and pure blue sky with no clouds. Mount Shasta loomed directly ahead as we headed north on I-5 before turning off near Red Bluff. It was 90 degrees at Red Bluff but by the time we got to the Kohm Yah-mah-nee Visitor Center, it was 58 degrees. The the vegetation transitioned from oak trees to tall pines to Western White Pines near the visitor center. We saw snow on the side of the road at about 4000 feet of elevation. 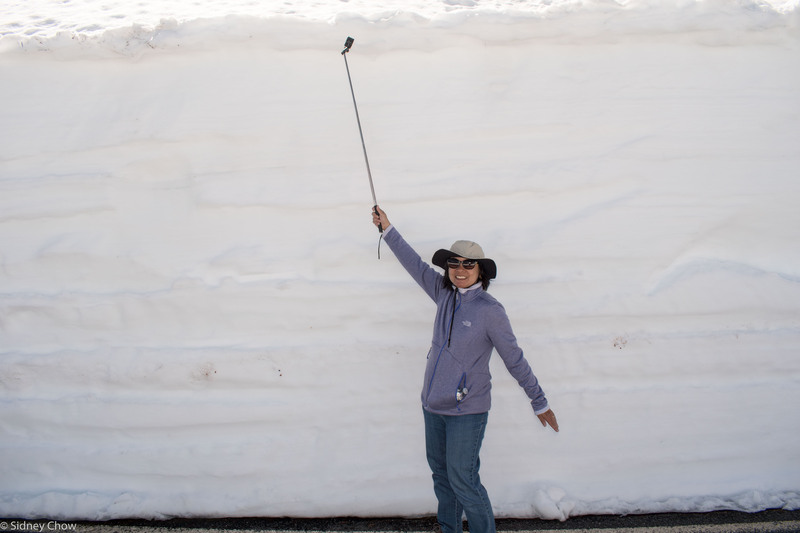 At the visitor center, 6707 feet in elevation, snow banks were 15 feet tall. Walls of snow 20 feet high flanked the path to the visitor center, taller than the orange poles meant to mark the walkway. I’ve never seen snow banks that tall. National Park Service started snow clearing operation on April 26 and cleared a mile of road by early May to reach Sulphur Works and its thermal features. It was open to foot traffic only so we walked up the road for a mile with a 300 feet elevation gain. The area around the mud pool was very warm, and the mud pool was bubbling over with steam rising from the grey mud. A small stream of 148 degree F water flowed down from the mountain that carved a wide path in the snow. The smell of sulfur was there but not overwhelmingly strong. Being able to see the geothermal feature was a pleasant surprise since I didn’t expect to be able to see anything except the visitor center and get a stamp. The road to Sulphur Works was dry with walls of snow 10 feet high on both sides of the road. The warm wind blew past the snow, making the air cool. The snow covered mountain in the distance with snow covered foreground and snow covered pine trees formed the iconic image of snow in the Cascades that made a perfect Christmas card. We only heard the sound of melting snow and the occasional chirping bird. We saw only six other people during our two mile long walk to Sulphur Works and back so we had this beautiful place on a warm sunny day nearly to ourselves. 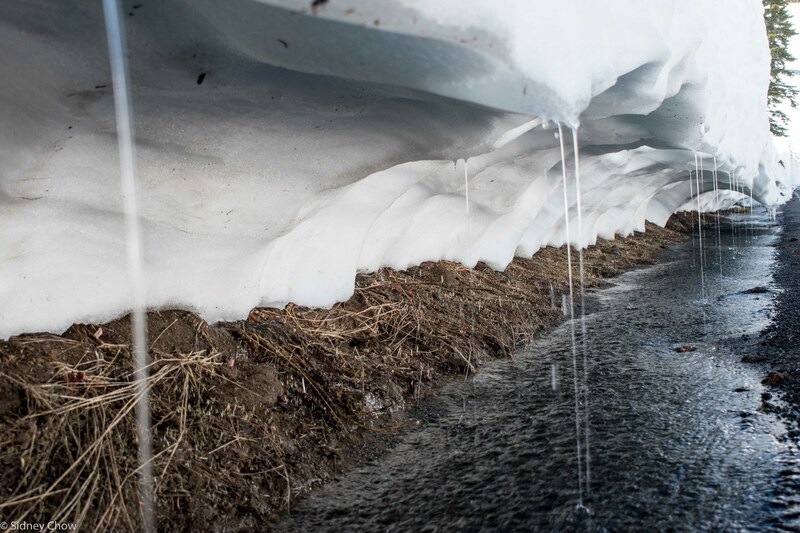 The melting snow we heard formed a stream down the side of the road with a snow overhang that formed a canopy above the stream. I wonder how long the overhang stayed in place before the weight collapsed it. The snow was white and pristine, not like the grimy, black and brown snow in cities. The pockets of snow had a blue tinge as it reflected the sun. The next day, we entered through the Manzenita Lake entrance on the northwest side of the park. There wasn’t a visitor center there and the museum was not yet open for the season. The feel was very different than the day before. No snow was on the ground, what a contrast with the southwest side of the park. At 5,880 feet of elevation, it was nearly a thousand feet below Kohm Yah-mah-nee and that made all the difference in snow pack. Manzenita Lake was very pretty, with clear water and a couple of ducks leisurely swimming about, ducking occasionally underwater to look for fish. They traveled in pairs, one of them white, the other brown. I carried my tripod on our 1.8 mile hike around the lake. Loretta has the patience of a saint as she waited for me to set up the shot in a couple of dozen places to get that perfect photo and video. The lake was calm, but not still, so I wasn’t able to get the shot I really wanted – the mountain peak reflected in the lake. The loop around the lake was nice and flat, but there were only a few places where I could get a clear view of the mountain peaks. Reflection Lake Route and Lily Pond Trail were just on the other side of the road and we hiked the trails. Lily Pond had lots of lily pads with bright yellow flowers blooming in the spring time. The interpretive guide did a good job introducing the various pines along the way. 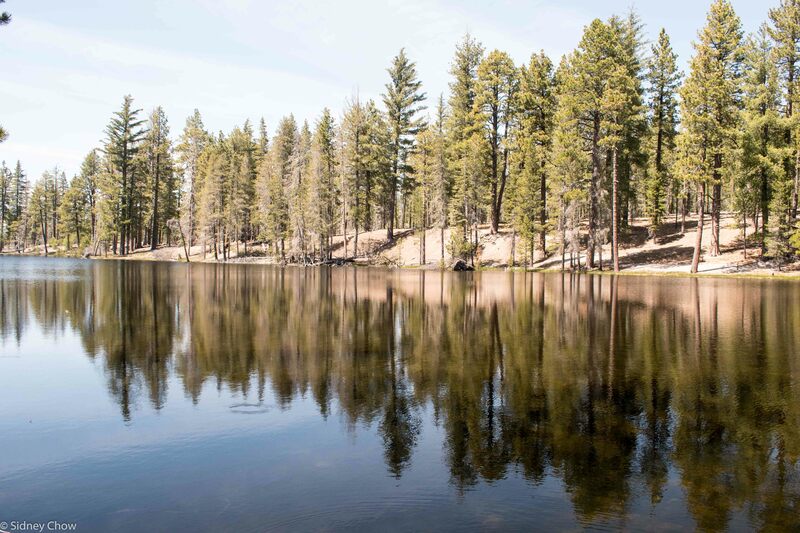 Contrary to my expectation, the reflecting pond only reflected the tall pines, not a mountain range. That was a bummer. We had to climb our way up, over and under the trunks of the many fallen trees from the winter. Parts of the paths were flooded and we had to scramble around them or gingerly stepping on the unstable rocks that cross them, playing hopscotch. Loretta didn’t like the extra things we had to do but I thought it was fun to do a little more than walking in the woods. We drove to Devastation Area, elevation 6470 feet, 10 miles up the road and the end of the snow removal operation. As the road climbed, snow piled up the sides of the roads. About a mile from Devastation Area, the meadows and the forest floor were covered with thick snow. There were five other cars at the parking lot and people were getting ready or just came back from snowboarding, cross country skiing, or snow shoeing. All were young and outdoors type. I can only imagine what the landscape looked like without the snow cover. After all, it’s called Devastated Area. A couple in their 50s pulled up in a big red pickup with a very happy and active black lab. They were from Wisconsin and have been on the road for six months. Their lab was very happy playing in the snow. There was pure joy in her face. Another car stopped by with an Asian couple and an old lady. The woman was holding the old lady’s hand as she was walking slowly, pointing to the snow banks, which were as high as seven feet, but no where near as imposing as the southwest entrance. Three feet of unplowed snow greeted the end of the road. 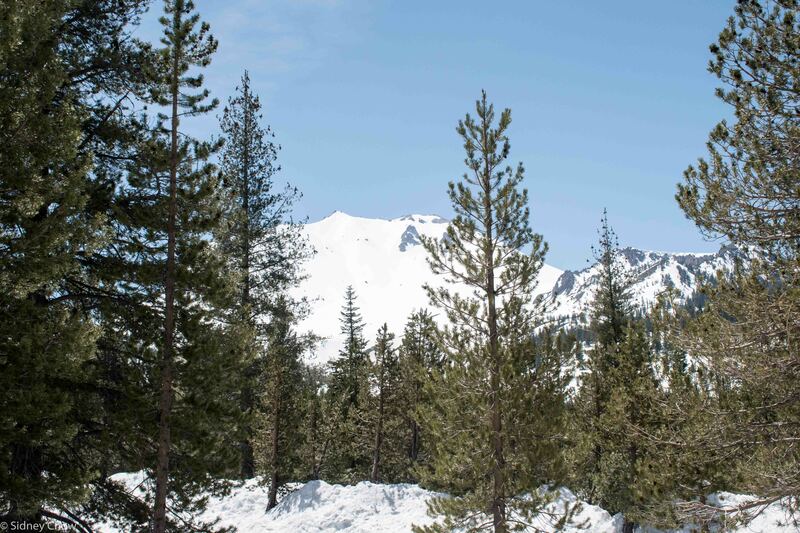 We saw the beautiful, tranquil and snow covered Lassen Peak from here. We passed a little history on the way back with Nobles’ Road, which was used by gold prospectors to reach the coast. Next was Chaos Crags and Chaos Jumbles, which was a whole mountain side covered by boulders of all sizes. There was a rock avalanche about 300 years ago when, for unknown reason, the rocks from Chaos Crag came tumbling down at more than 100 miles per hour. There was minimal vegetation, even today. Walk a mile in another person’s shoes to understand their situation, just like seeing the huge snowbanks at Lassen Volcanic National Park gives the right perspective of how deep snow can be. This park is an undiscovered gem. It has beautiful scenery, geothermal features, great hiking and many lakes. We only scratched the surface during our trip due to snow. There are many alpine lakes within a reasonable hike from the road. There are steam vents, mud pools, the best of which we were not able to reach. All types of volcanic formations are here with a cinder cone to observe. The variety and accessibility (during summer) are excellent. While we didn’t see most of the park, we saw the incredible amount of snow this park receives. Imagining 40 feet of snow is difficult, until you see a wall of snow next to the road that was 20 feet high, then imagine doubling that. I can appreciate the herculean task of snow removal, even in 60 degree sunny days. Spring snow skiing or snow shoeing is excellent because of the solitude and the beautiful snow covered landscape. Those were beyond our ability or interest but I can see how tranquil and quiet it can be in the backcountry. I will return to fully experience this promising park. 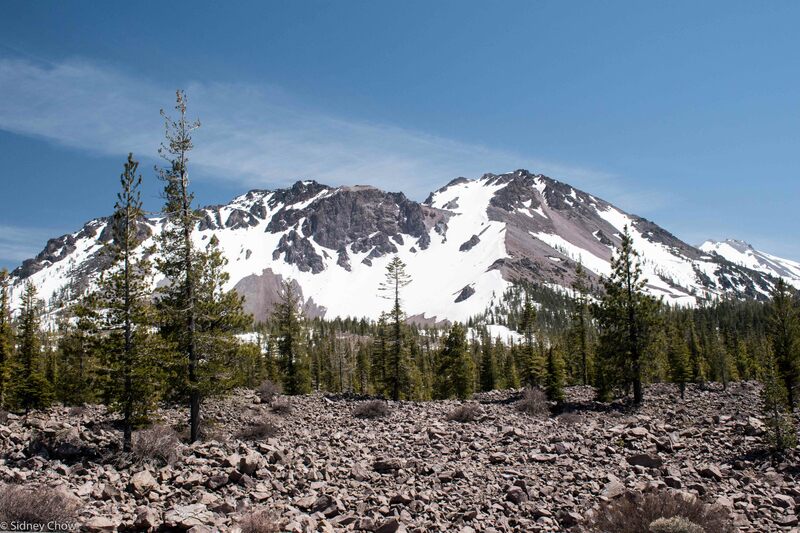 Have you visited Lassen Volcanic? Leave a comment below on your experience. Click on the Follow link and get an email when new postings are available. I will not share your email so no worries. Visit between late July and September to avoid the snow. Visit in early fall or late spring for snow activities in warm temperatures. Check the weather and road conditions if you plan to visit between October and July. Check trail conditions because some of them may be snow covered even when the road is open. Fill up and bring food. There is no fuel or food in the park. Redding or Red Bluff are both good gateway cities. Redding is larger with more choice for services. Size: 112,512 acres, ranked 37th. Visitors: 536,068 in 2016, ranked 36th. 2016 was a record year. Peak Month in 2016: 120,958 visitors in July. Low Month in 2016: 5,430 visitors in December. Entrance Fee: $20 per vehicle, $10 per person not in a vehicle. 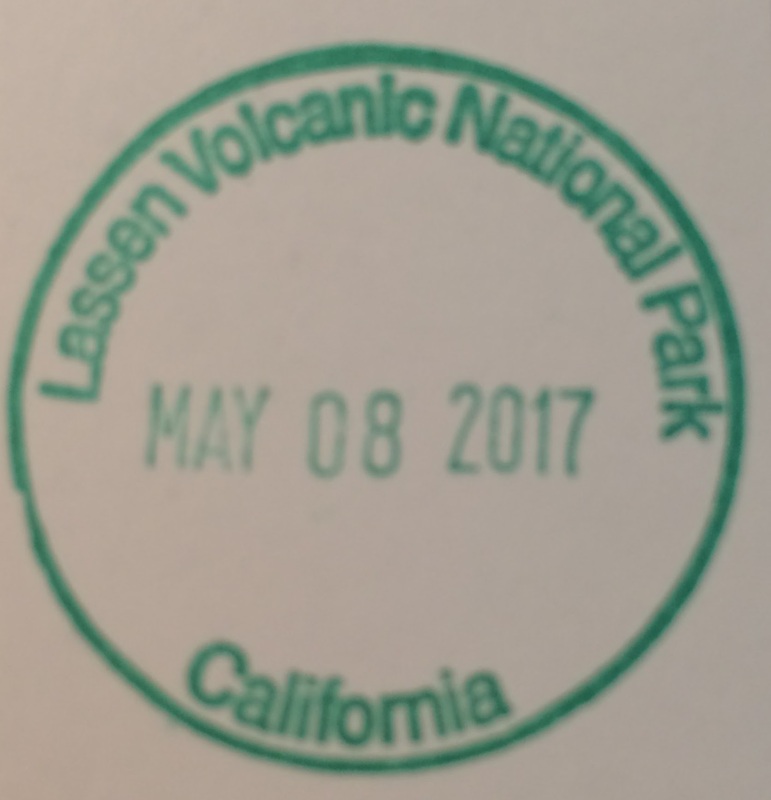 So which National Park is not considered back country? 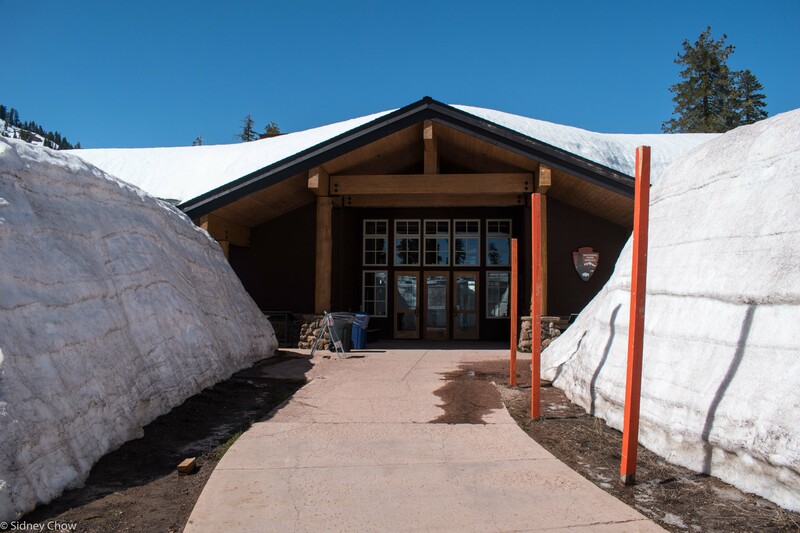 And that’s a lot of snow on top of that Welcome Center!